This entry was posted on Monday, March 29th, 2010 at 4:00 am	and is filed under Appetizers, Candy and Fudge, Holiday Foods, Vegetables. You can follow any responses to this entry through the RSS 2.0 feed. You can leave a response, or trackback from your own site. Both these recipes look good. 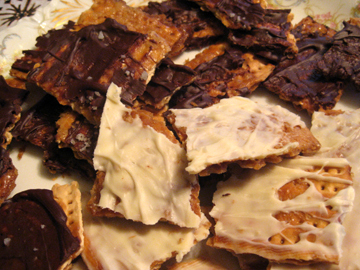 The store, Economy Candy, on the Lower East Side of NYC sells really good chocolate-covered matzos, and the great deli, Russ & Daughters, sells amazing toffee chocolate matzoh for Passover. 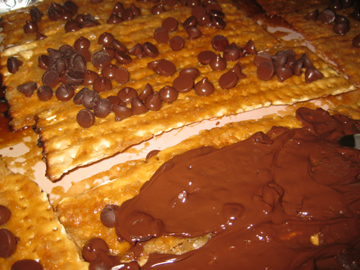 So, the idea of your Matzo Crunch very much fits into the traditions of our NYC Jewish delis. Had to catch up with you. Your cooking with love post was…well…lovely. I, too, am a die-hard list maker. Happy Passover, Tinky! I’ve always wanted to be invited to a Seder, being the lover of traditions that I am. I’ll have to work on getting myself invited to one. 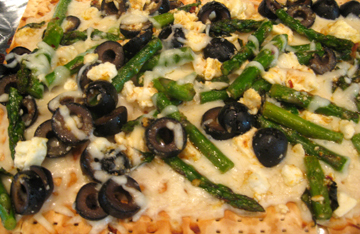 In the meantime, think I’ll try that Matzo pizza – which looks divine (no pun intended)! This is one of the things I love about blogs – finding out about other people’s traditions …. and the food associated with them. Hi Tinky- I taught Sunday School and made unleavened fried bread with the kids! Fried in a pan w/ butter of course, so a bit more decadent than perhaps matzo. But, they experienced a last supper, and said it was the best Sunday School ever! Your recipes sound wonderful~thanks. I wish I could have seen it, Susan! 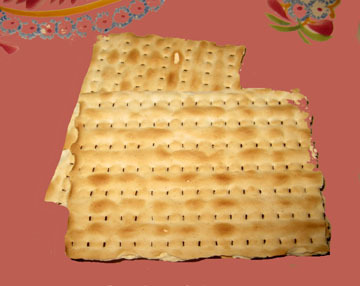 Happy Passover all, and thanks for stopping by. I love to hear about everyone’s plans–and Teri you have reassured me with your words about New York, NY. If I can make it there, I’ll make it anywhere. Gee, that sounds familiar………..